The Miracle of the Golden Table-Leg. Scholar and miracle-worker of the first century; pupil of Johanan b. Zakkai (Ber. 34b). While he is reckoned among the Tannaim and is quoted in connection with a school and its disciples, no halakot and but few haggadot are preserved as from him (Baraita of R. Eliezer xxix., xxxi. ; Midr. Mishle x. 2). His popularity, however, which he enjoyed throughout his life, and which rendered him immortal among the mystics, rests not on his scholarship, but on his saintliness and thaumaturgic powers. From the several maxims attributed to him it may be seen that he was a member of the Ḥasidim: "Whosoever's fear of sin precedes his learning, his learning will endure; but where learning precedes fear of sin, learning will not endure"; "Where a man's works are greater than his learning, his learning will stand; but where his learning is greater than his works, his learning will not stand"; "Whosoever earns the good-will of humanity is loved of God; but whoso is not beloved of man is not beloved of God" (Ab.iii. 9, 10; Ab. R. N. xxii. 1 [ed. Schechter, p. 35a]; for the corresponding Ḥasidean principles see Jew. Encyc. v. 225, s.v. Essenes). There are, also, other teachings which betray his Ḥasidic schooling. Ḥa-nina, like all the ancient Ḥasidim, prayed much, and by his prayers he is said to have effected many miracles. 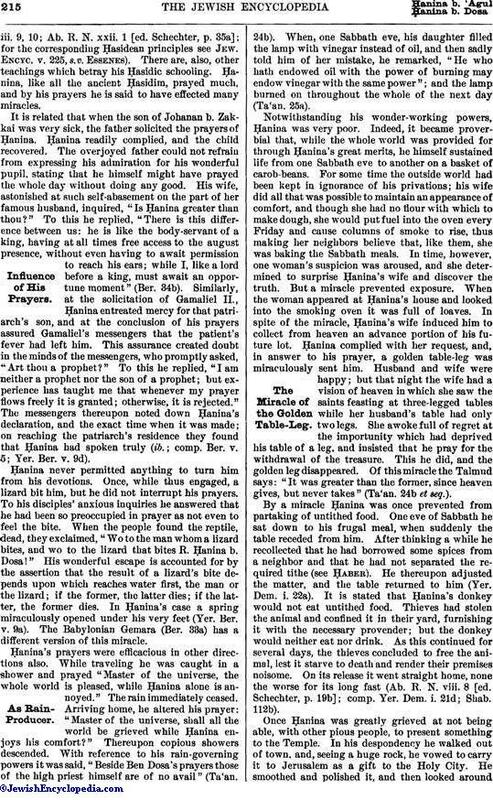 It is related that when the son of Johanan b. Zakkai was very sick, the father solicited the prayers of Ḥanina. Ḥanina readily complied, and the child recovered. The overjoyed father could not refrain from expressing his admiration for his wonderful pupil, stating that he himself might have prayed the whole day without doing any good. His wife, astonished at such self-abasement on the part of her famous husband, inquired, "Is Ḥanina greater than thou?" To this he replied, "There is this difference between us: he is like the body-servant of a king, having at all times free access to the august presence, without even having to await permission to reach his ears; while I, like a lord before a king, must await an opportune moment" (Ber. 34b). Similarly, at the solicitation of Gamaliel II., Ḥanina entreated mercy for that patriarch's son, and at the conclusion of his prayers assured Gamaliel's messengers that the patient's fever had left him. This assurance created doubt in the minds of the messengers, who promptly asked, "Art thou a prophet?" To this he replied, "I am neither a prophet nor the son of a prophet; but experience has taught me that whenever my prayer flows freely it is granted; otherwise, it is rejected." The messengers thereupon noted down Ḥanina's declaration, and the exact time when it was made; on reaching the patriarch's residence they found that Ḥanina had spoken truly (ib. ; comp. Ber. v. 5; Yer. Ber. v. 9d). Ḥanina never permitted anything to turn him from his devotions. Once, while thus engaged, a lizard bit him, but he did not interrupt his prayers. To his disciples' anxious inquiries he answered that he had been so preoccupied in prayer as not even to feel the bite. When the people found the reptile, dead, they exclaimed, "Wo to the man whom a lizard bites, and wo to the lizard that bites R. Ḥanina b. Dosa!" His wonderful escape is accounted for by the assertion that the result of a lizard's bite depends upon which reaches water first, the man or the lizard; if the former, the latter dies; if the latter, the former dies. In Ḥanina's case a spring miraculously opened under his very feet (Yer. Ber. v. 9a). The Babylonian Gemara (Ber. 33a) has a different version of this miracle. Ḥanina's prayers were efficacious in other directions also. While traveling he was caught in a shower and prayed "Master of the universe, the whole world is pleased, while Ḥanina alone is annoyed." The rain immediately ceased. Arriving home, he altered his prayer: "Master of the universe, shall all the world be grieved while Ḥanina enjoys his comfort?" Thereupon copious showers descended. With reference to his rain-governing powers it was said, "Beside Ben Dosa's prayers those of the high priest himself are of no avail" (Ta'an. 24b). When, one Sabbath eve, his daughter filled the lamp with vinegar instead of oil, and then sadly told him of her mistake, he remarked, "He who hath endowed oil with the power of burning may endow vinegar with the same power"; and the lamp burned on throughout the whole of the next day (Ta'an. 25a). Notwithstanding his wonder-working powers, Ḥanina was very poor. Indeed, it became proverbial that, while the whole world was provided for through Ḥanina's great merits, he himself sustained life from one Sabbath eve to another on a basket of carob-beans. For some time the outside world had been kept in ignorance of his privations; his wife did all that was possible to maintain an appearance of comfort, and though she had no flour with which to make dough, she would put fuel into the oven every Friday and cause columns of smoke to rise, thus making her neighbors believe that, like them, she was baking the Sabbath meals. In time, however, one woman's suspicion was aroused, and she determined to surprise Ḥanina's wife and discover the truth. But a miracle prevented exposure. When the woman appeared at Ḥanina's house and looked into the smoking oven it was full of loaves. In spite of the miracle, Ḥanina's wife induced him to collect from heaven an advance portion of his future lot. Ḥanina complied with her request, and, in answer to his prayer, a golden table-leg was miraculously sent him. Husband and wife were happy; but that night the wife had a vision of heaven in which she saw the saints feasting at three-legged tables while her husband's table had only two legs. She awoke full of regret at the importunity which had deprived his table of a leg, and insisted that he pray for the withdrawal of the treasure. This he did, and the golden leg disappeared. Of this miracle the Talmud says: "It was greater than the former, since heaven gives, but never takes" (Ta'an. 24b et seq.). By a miracle Ḥanina was once prevented from partaking of untithed food. One eve of Sabbath he sat down to his frugal meal, when suddenly the table receded from him. After thinking a while he recollected that he had borrowed some spices from a neighbor and that he had not separated the required tithe (see Ḥaber). He thereupon adjusted the matter, and the table returned to him (Yer. Dem. i. 22a). It is stated that Ḥanina's donkey would not eat untithed food. Thieves had stolen the animal and confined it in their yard, furnishing it with the necessary provender; but the donkey would neither eat nor drink. As this continued for several days, the thieves concluded to free the animal, lest it starve to death and render their premises noisome. On its release it went straight home, none the worse for its long fast (Ab. R. N. viii. 8 [ed. Schechter, p. 19b]; comp. Yer. Dem. i. 21d; Shab. 112b). Once Ḥanina was greatly grieved at not being able, with other pious people, to present something to the Temple. In his despondency he walked out of town, and, seeing a huge rock, he vowed to carry it to Jerusalem as a gift to the Holy City. He smoothed and polished it, and then looked aroundfor help to transport it. Five laborers appeared, and offered to carry the rock to its destined place for one hundred gold pieces. Ḥanina, who did not possess half that amount, turned away in despair. Soon, however, other laborers appeared and demanded only five "sela'im," but they stipulated that Ḥanina himself should aid in the transportation. The agreement concluded, they all seized the rock, and in an instant stood before Jerusalem. When Ḥanina turned to pay the laborers they were nowhere to be found. He repaired to the Sanhedrin to inquire what disposition he should make of the uncollected wages. The Sanhedrin heard his tale and concluded that the laborers were ministering angels, not human laborers, and that Ḥanina was therefore at liberty to apply the money to his own use. He, however, presented it to the Temple (Cant. R. i. 1; Eccl. R. i.). Thus was Ḥanina's life a succession of miracles (see Pcs. 112b; B. Ḳ. 50a). 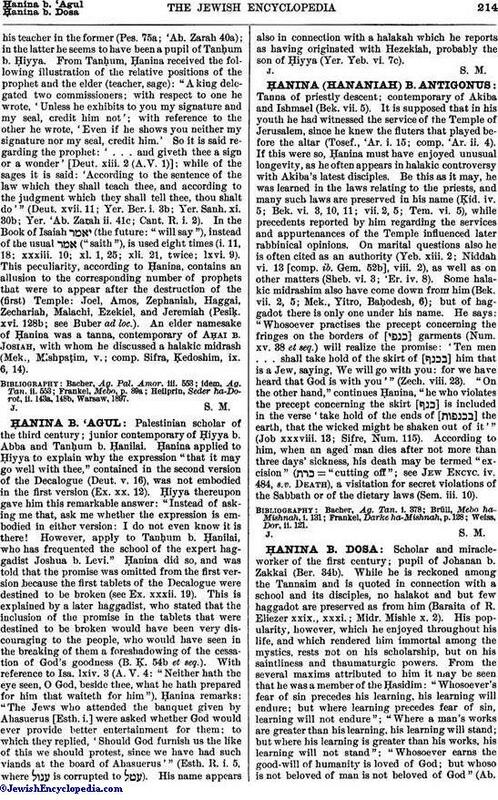 A comparatively late mishnah remarks, "With the death of Ḥanina b. Dosa wonder-workers ['anshe ma'aseh'] ceased to exist" (Soṭah ix. 15). His general character was likewise extolled. A contemporary rabbi, Eleazar of Modi'im, lecturing on Ex. xviii. 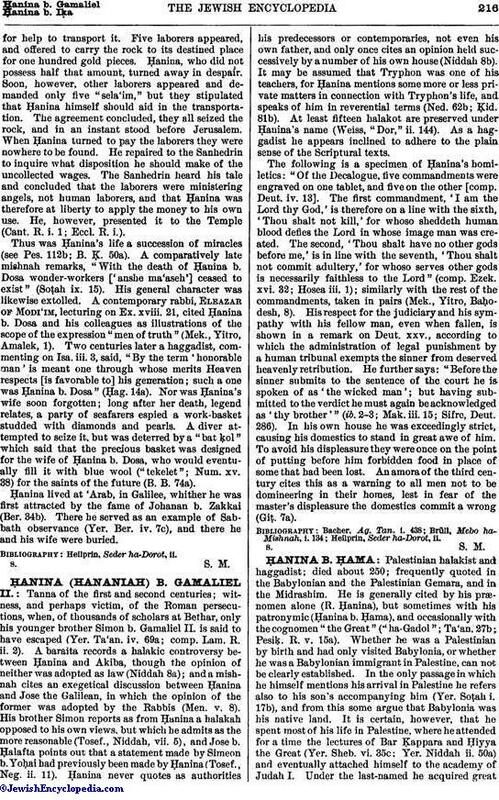 21, cited Ḥanina b. Dosa and his colleagues as illustrations of the scope of the expression "men of truth" (Mek., Yitro, Amalek, 1). Two centuries later a haggadist, commenting on Isa. iii. 3, said, "By the term 'honorable man' is meant one through whose merits Heaven respects [is favorable to] his generation; such a one was Ḥanina b. Dosa" (Ḥag. 14a). Nor was Ḥanina's wife soon forgotten; long after her death, legend relates, a party of seafarers espied a work-basket studded with diamonds and pearls. A diver attempted to seize it, but was deterred by a "bat ḳol" which said that the precious basket was designed for the wife of Ḥanina b. Dosa, who would eventually fill it with blue wool ("tekelet"; Num. xv. 38) for the saints of the future (B. B. 74a). Ḥanina lived at 'Arab, in Galilee, whither he was first attracted by the fame of Johanan b. Zakkai (Ber. 34b). There he served as an example of Sabbath observance (Yer. Ber. iv. 7c), and there he and his wife were buried.